People who work in offices have no doubt heard the horribly annoying phrase “We’re not reinventing the wheel here” way too many times. 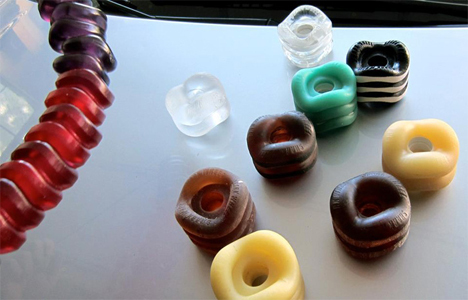 But skateboarder David Patrick did just that with his invention, SharkWheel: he took a skateboard wheel and made it square. 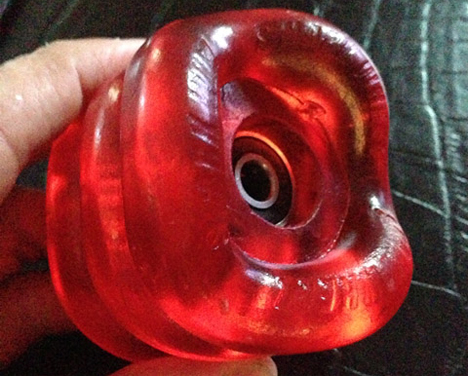 Like a lot of great inventions, the SharkWheel came about thanks to an accident. Patrick was making a cube from pieces of soft piping, and when he dropped it he was shocked to see it roll across the floor…and roll, and roll, and roll. Its shape made it able to keep going over any type of terrain. The idea of a square wheel seems ridiculous – and in a way, it is. The SharkWheel isn’t exactly a square or cube; the inventor calls it “a perfect cube, a perfect circle, and a perfect sine wave.” It works because its shape handles different terrain with ease, and its reduced surface area makes it way faster than conventional skateboard wheels. From the side, the SharkWheel looks like a square when it’s rolling. From the front or back, the wheels come to life when they roll; they look kind of like a group of wriggling snakes. 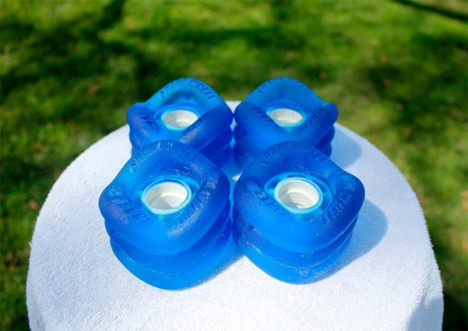 According to experienced skateboarders, the SharkWheel offers unparalleled stability and control. The wheel has been patented and successfully completed a Kickstarter campaign, raising nearly eight times the original goal. The SharkWheel doesn’t have to stop at skateboards. Although the inventor intended them for that purpose, it has since become obvious that the unique shape is a huge improvement on the simple circle we’ve been using for several thousand years. In future years, we could very well see modified wheels like the SharkWheel on cars and bikes, too. See more in Mods & Custom or under Transportation. April, 2014.